Our 4-year B.Comm. degree helps students develop the critical thinking, problem solving, communication and teamwork skills that employers demand. In 2017, 93% of graduates were employed in their field within 6 months of graduation. Join us today and experience all that Edwards has to offer! Join the business program when you're ready - we offer admission for Fall and Winter starts. Students who take a year off from university and are in good standing1 when they leave can apply to return before August 15th each year and will be guaranteed admission back to the program. Apply through PAWS or complete a new application as a 'returning student'. 1 Students in the B.Comm. program are in good standing as long as they maintain a 60% or higher year average. Discover why business is the right choice for you. AFOA graduates of the Aboriginal Financial Management (AFM) Diploma program can transfer 42 credits into the B.Comm. program at Edwards. This agreement was signed in 2010 and applies to students who completed the curriculum in place at the time of signing. "This represents an exceptional opportunity for Aboriginal people who are trying to pursue an education in the field of finance. Aboriginal communities are in dire need of educated finance and business professionals." 1 Students are conditionally admitted prior to completion of the test and are fully admitted once they earn a grade of 70% or higher. Those who don't meet this average requirement will be required to complete MATH 102.3: University Pre-Calculus or an equivalent courses in their first year of study. Upon successfull completion, students will be fully admitted to the B.Comm. program. The Business Administration Certificate program is a part-time eight course program offered in the evenings to accommodate adult learners who are working during the day. All classes are held in the PotashCorp Centre at the Edwards School of Business. Students who complete the Business Studies program at Vancouver's Dorset College can directly transfer 30 credits in the Bachelor of Commerce (B. Comm.) program at Edwards School of Business. Dorset students are also eligible for two annual awards upon admission to Edwards School of Business. Lakeland College graduates of the two year business diploma in Accounting, General Business or Small Business & Entrepreneurship can transfer two years toward the four-year Bachelor of Commerce degree offered through Edwards. This agreement was signed in 2019 and students who began studies at Lakeland in 2017 or later are eligible to apply. SIIT graduates of the 1-year business certificate or 2-year business diploma in Accounting, Business Administration or Human Resource Management can transfer 30 credits or 60 credits, respectively, into the B.Comm. program at Edwards. This agreement was signed in February 2014 and applies to students who completed the curriculum in place at the time of signing. Sask Polytech graduates of the one-year business certificate or two-year business diploma in Accounting, Human Resources, Management or Marketing can transfer 30 credits or 60 credits, respectively, into the B.Comm. program at Edwards. This agreement was signed in April 2016 and applies to students who completed the curriculum in place at the time of signing. 1 Students graduating with a diploma in Accounting must also earn an average of 72% in second year to ensure that they are adequately prepared for upper year accounting courses offered by the Edwards School of Business. Those who complete the 1-year business certificate only have to meet the transfer average in place in the year they apply to Edwards. *Note: Current students who wish to visit another institution and transfer courses to the Edwards B.Comm. degree must request permission prior to registration. The combined B.Comm./JD (Juris Doctor) program allows a student to obtain both the Bachelor of Commerce and Law degrees in six years rather than the seven years needed to complete the degrees separately. The College of Law offers a sense of community in a small college of less than 400 students from diverse backgrounds. Students interested in this program should consult an advisor regarding the necessary substitution of classes in years two and three in order to complete all necessary requirements. "A business background seemed to mesh well with that kind of law," she says. "And a law firm is still a business when it comes down to it, so understanding how businesses work is important." A combined B.Comm./B.S.A. degree can be achieved in six years or less by selecting appropriate courses and electives in the Agriculture B.S.A. program. Students wishing to pursue Agriculture and Business should originally apply to the College of Agriculture. A student who wishes to pursue a B.Comm./B.A. or B.Sc. degree must complete the equivalent of a minimum of 150 credit units if they are obtaining a B.A. or B.Sc. three-year degree or a minimum of 180 credit units for a B.A. or B.Sc. four-year degree. Further, in order to meet the requirements of the B.Comm. degree, the student must complete at least 60 credit units selected in such a manner as to satisfy requirements in both colleges. Students wishing to complete both Arts and Science and Business degrees can originally apply to either the College of Arts & Science or the Edwards School of Business. Students attending Edwards have access to a full range of funding through scholarships, awards and bursaries which recognize academic achievement, financial need and leadership through extracurricular involvement in the School, University and/or wider community. There are awards that recognize students from particular backgrounds, acknowledge contributions to certain clubs, and reward outstanding achievement in different areas such as athletics. Through the generosity of alumni and friends, these scholarships, awards and bursaries amount to over $1.3 million annually ranging from $200 - $10,000 each. Whether you are a continuing student or an entering student, we have a number of awards that you can apply for. For detailed information please review all University of Saskatchewan Scholarships and Bursaries at https://students.usask.ca/money/scholarships.php. There are general awards and there are Edwards specific awards, so to find the Edwards awards simply type “Edwards” in the search for awards section to find what you are looking for. For Edwards specific awards and bursaries for continuing students, the awards application period is March and September of each year. 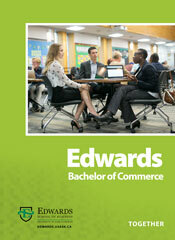 The application is only open during those months and can be found here https://www.edwards.usask.ca/Apps/Awards. Award recipients are recognized annually at an Awards Reception hosted by Edwards School of Business, November of each year. Recipients, donors and guests are invited to attend the event where Edwards celebrates the student's achievements. One of the most frequent questions asked by students (and their parents) is "how much will first year cost?" In 2018-19, first year domestic students will pay approximately $8,147.15 in tuition and fees based on completion of 30 credit units. 1 Will vary depending on choice of electives. 2 Includes Heath & Dental fee of $250.17 which has an opt-off option with proof of other coverage. Academic advising is a partnership and shared responsibility between each student and their advisor. It helps students develop an educational plan that fits their abilities, interests, personal circumstances, and career goals. Prospective students receive one-on-one guidance on undergrad and certificate business programs, university services and referrals to other units on campus. Make an appointment by calling 306-966-4785, emailing undergrad@edwards.usask.ca or dropping by in-person at the office in Room 185. Current U of S students can book an advising appointment online. Directions to the Student & Faculty Services Office: Enter the front doors of the Nutrien Centre (25 Campus Drive) and go up the stairs. Turn left into the Office Wing and then left again. Our office is at the end of the hallway in Room 185.